Helicopters and planes can of course be fun, but they do make a lot of noise. And they're complicated things to learn, not to mention expensive. Paragliders are quiet and cheap, but with tandem flights you're just a passenger and with solo flights it takes a while to really get up high. We were looking for a way to try out a bit of flying (which means, flying ourselves), without all that engine drone - a 'purer' kind of flying, if you like. And that's when we thought of gliding. After a little searching, we found a "taster session" for beginners, which lasts a single day and includes a theory lesson and one flight. We won't be just passengers though, it's an introduction to flying rather than a scenic tourist trip (although it is that as well!) - the gliders are two-seaters with dual controls so we're expecting to get a good go of flying it ourselves. First of all it's off to the classroom to learn a bit of theory. This was an excellent introduction to the whole thing, starting off with a bit of history and the basics of how the plane flies. This included the very basics of an aerofoil wing and the control surfaces on the plane (the moveable bits which control the steering). As well as the talk of yaw and pitch, and glide ratios, they discussed the various sources of rising air (vital for a glider) including ridge flow and thermic currents, and how to spot such rising air by the clouds forming above. As the air rises, it is cooled and can no longer hold as much water vapour, which then condenses out as telltale clouds. Pilots can then use these to look for rising air patterns to stay aloft. Also included in the lesson was the layout of the airfield we were using, including ground rules for safety and for the movement of planes on the ground. 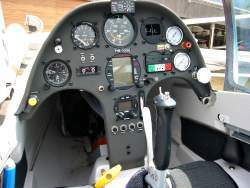 Looking inside the cockpit, there are just two basic controls - a stick, and a pair of foot pedals. The foot pedals control the rudder on the tail, pushing forward with the left foot to turn left, and with the right foot to turn right. (Odd that this is opposite to both helicopters and land yachts!). The stick controls the elevators on the tail for up and down, and also the ailerons on the wings for rolling left and right. And that's more or less it for controls. The instruments are also relatively simple - no rev counter or fuel gauge of course, just an altimeter, an air speed indicator, a vario showing rate of climb / descent, and a compass. On our gliders there was also an electronic collision warning indicator, which used transponders to spot when another (similarly equipped) plane was in the vicinity. After the theory lesson, (and after waiting for the runways to be pumped free of water! 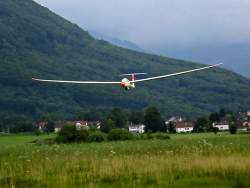 ), we finally got our first look at the gliders themselves. Very new, very shiny, and very small. The two-person cockpit is just a bulbous blob attached to the delicate wings, the whole craft being super streamlined and very light. Both seats are equipped with all the controls and all the instruments, with the instructor sitting in the rear seat and we excited students getting the front seat. There was a bit of a queue for the first flight, as we waited for our turn to be pulled up by the little propellor plane. But we were all given a chance to help out with the manoeuvering of the planes on the ground, the connection of the tow rope, and the signalling to the towing pilot when everything was ready. Finally it was time to go, and we strapped ourselves into the tiny cockpit. Complete with parachute (but without any instructions how to use it! ), but without helmet or headphones, we sat back and watched as the towing plane took up the strain and started to pull our glider along the runway. The instructor made it look easy to control the glider, keep it on course and avoid scraping the wings along the ground, but then again he had done it before. We were soon hauled up to around 1200m (the runway was at around 500m) and our towing cable was disconnected. And there we were, flying!! It definitely wasn't as quiet as I expected though, as the wind roar in the cabin really was a roar, especially when the vents were opened a bit to let in some cooler air. But we really were flying, and feeling every nuance of the invisible but turbulent air around us. Quite surreal. Shortly the instructor asked if I was ready to have a go myself. Aha, but of course! So with a word I was flying a glider for the first time! The first thing I noticed was that the controls were surprisingly heavy, especially in comparison to the helicopter where the slightest nudge on the stick would send the whole craft off in a completely different direction. It took a little getting used to how it reacted to the stick and the pedals, and a mistake I kept on making was to hold the nose too high, thereby losing speed. The vario was very slow to react to changes, and a little erratic, so more than once I was told to bring the nose down to maintain our speed. Much of the focus of the flight, which lasted around an hour in total, was the search for rising air and the avoidance (or speeding through) of falling air. Once we found a rising current, we'd immediately circle round to explore it and try to use it to gain height. A good one was swiftly reported over the radio for the other pilots, but they were often elusive or transient. We alternated the controls during the flight, so the instructor flew for a while, with his adjustments observable on the movement of the stick and pedals, and then I was given the controls for a while. The glider can really tip up sideways when going round a tight turn, and although all of our sickbags remained thankfully unused, the thought did cross most of the students' minds at some point in the hot cockpit. But it was nevertheless with reluctance that we came back down to the airfield again, the instructor lining the plane up with the runway and applying the air brakes on the wings to reduce speed. After a very soft landing, and with big smiles, we manoeuvred the glider back into the queue for the next flight. An experience indeed, and well worth the cost. The airfield we used also offers the full training programme, but then it starts to get expensive - months of one-on-one training, plus licence fees and plane rental and everything before you can fly on your own. In the meantime, this was an excellent day out to experience what gliding is like, and comes thoroughly recommended. 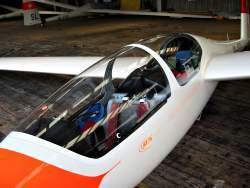 We took a taster day at schaenissoaring.ch, who have an airfield in Schänis just north of Ziegelbrücke. A one-day course here (called a "Segelflugzeug Schnupperkurs") costs CHF 120. 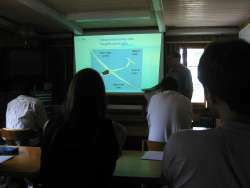 The theory course was run in swiss dialect, but several of the instructors also speak good English. Page last updated September 2005. Feedback welcome at mail@activityworkshop.net.